Youth with disabilities, especially youth receiving Supplemental Security Income (SSI), face unique challenges that affect their employment prospects as they become adults. 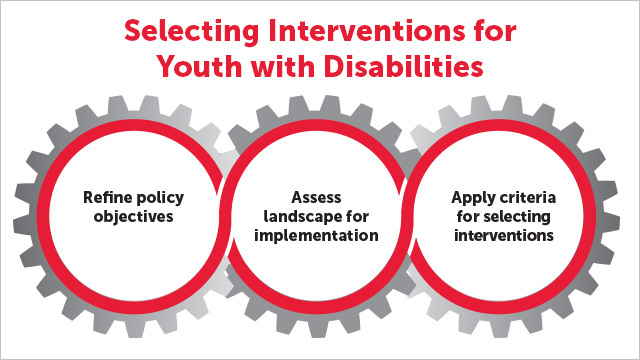 This is a singular time in their lives when better interventions could make longstanding impacts on outcomes for youth with disabilities. A new series of reports and webinars by Mathematica for the U.S. Department of Labor provides practical advice to policymakers about how to select and test promising strategies that could help youth with disabilities achieve sustained and gainful employment. In the latest blog post for Evidence in Action, project director Todd Honeycutt shares his insights on the need for better solutions to address the hurdles that youth receiving SSI encounter in their transitions to adulthood. He also writes about five strategies policymakers can pursue to ensure transition programs make a difference. Resources developed from this project were informed by input from a Community of Practice that included 70 experts from federal and state agencies, practitioners, researchers, consumer groups, and other stakeholders. Based on the advice of the Community of Practice and a review of the evidence, Mathematica researchers recommend two approaches to improve the prospects of youth with disabilities. The first approach is to select a promising intervention, implement it, and assess its effectiveness, which could involve small pilot tests or large demonstration projects. The second approach is to design a broad research and development agenda to help the federal government proceed with a systematic approach to support youth with disabilities in transitioning from school to work. Mathematica is partnering with the Office of Disability Employment Policy to clarify the existing evidence about transition initiatives and help move efforts forward to improve outcomes for youth with disabilities. To learn more about the project and access its resources, visit the webpage for the Evaluation of Initiatives to Improve Adult Outcomes and Employment Opportunities for Young Recipients of Supplemental Security Income (SSI). This project was prepared for the U.S. Department of Labor (DOL), Office of Disability Employment Policy by Mathematica Policy Research, under contract number DOLQ129633249. The views expressed are those of the authors and should not be attributed to DOL, nor does mention of trade names, commercial products, or organizations imply endorsement of same by the U.S. Government. Young people with disabilities, particularly those who receive Supplemental Security Income (SSI), face unique challenges as they transition into adulthood. Even with targeted support services, they often fall behind their peers in their educational and economic attainment as adults.